Time Bandits is a professional team of historical costumed interpreters and re-enactors who are dedicated to bring history to life in the North East and beyond. They work with with a wide range of public sector organisations, from schools to museums. Popular school workshops are suitable for Key Stages 1 - 4. Time Bandits specialise in a cross-disciplinary approach to stimulate reflection and interaction, in order to achieve a critical perspective as well as a wider understanding of key issues. Current clients include the Alnwick Castle, Hartlepool Borough Council, LookwideUK, the National Trust and Tyne, Newcastle City Council and Wear Archives and Museums. Each session is intended to extend for a period of 45 minutes, (allowing for a 5 – 10 minute plenary session at the conclusion of each), split between three block sessions during the day, delivered in each instance by costumed interpreters with a full handling collection, viz: Uniform, webbing, inert ordnance & grenades, de-activated firearms, blunted edged weapons, trench maces, trench art, trench maps and battlefield relics, trench diaries & letters. The sessions are intended to be essentially hands-on with discussion and interaction throughout; students will be invited to look at and handle the collection/artifacts, to read from diaries, memoirs, letters and poems. There will be simulations of drill, battle and aftermath. We will avoid lecture format with an emphasis on interaction and involvement. Time Bandits offer an opportunity to get hands on with war time foods. See how people saved money, fuel and lives by using what could be produced locally. Compare their ideas of healthy eating with ours and explore your local heritage at the same time. Do you know what a Northumberland pudding was? Wow your friends with date and nut sandwich filling and then watch them wriggle when you offer porridge bread to serve it on! Finish up with a salute to our allies - Anzac biscuits and maize scones. 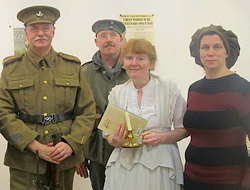 Students will compose their own ‘letters from the Front’, attempt their own poetry and have the chance to enact scenes from drama (Journey’s End) and to act a tribunal. Students should be prepared by being encouraged to attempt period clothing, to research archive material and to consider any individual family histories they are aware of. Facilities required; two standard trestle tables; Power-point projection, TV & DVD, reasonable performance type area. Redefining the Front – the Flanders Line.